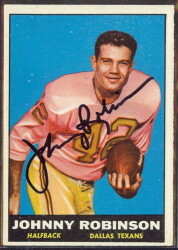 When the term “Fearsome Foursome” is used by football fans, it is typically in reference to the Los Angeles Rams defensive line of the 1960s that featured Deacon Jones, Lamar Lundy, Merlin Olsen and Rosey Grier. That Rams’ line was a fine one indeed, but it is a common misconception that it was the only or original Fearsome Foursome. In fact, the San Diego Chargers of the old AFL featured the original Fearsome Foursome a few years earlier and 100 miles to the South. 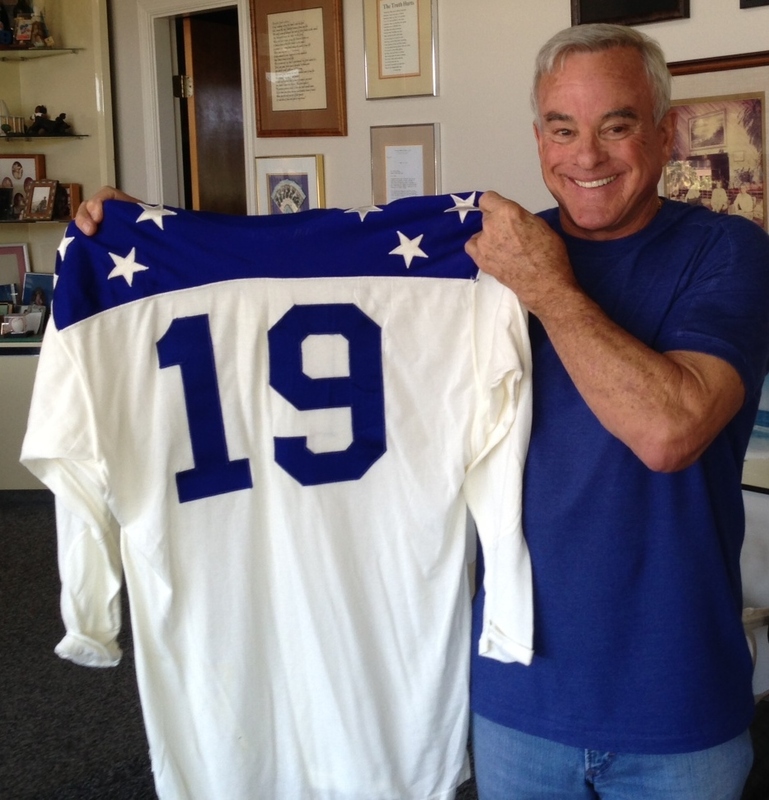 The Chargers had just settled into their new home in San Diego when the 1961 football season came rolling around. After fleeing the cavernous Los Angeles Coliseum the year before, the Chargers traded their downtown LA home for the cozier confines of San Diego’s Balboa Stadium. San Diegans were quick to adopt their new team and the many interesting players that came with it. The Chargers began the 1961 with what was believed to be the largest defensive line in professional football, a group of four men that averaged 6’ 6 ½” in height and 273 lbs. 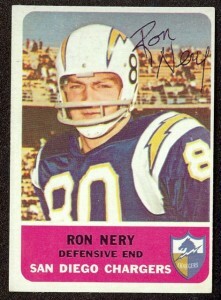 Ernie Ladd, Bill Hudson, Earl Faison and Ron Nery wreaked havoc on offensive lines throughout the AFL. Their relentless pursuit of opposing quarterbacks helped the Chargers secondary set a league record with 49 interceptions on the season. 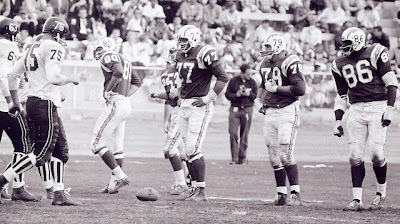 Dubbed the “Fearsome Foursome” in that first year in San Diego, the Chargers defensive line is a group that still inspires awe in the men who faced it 50 years ago. 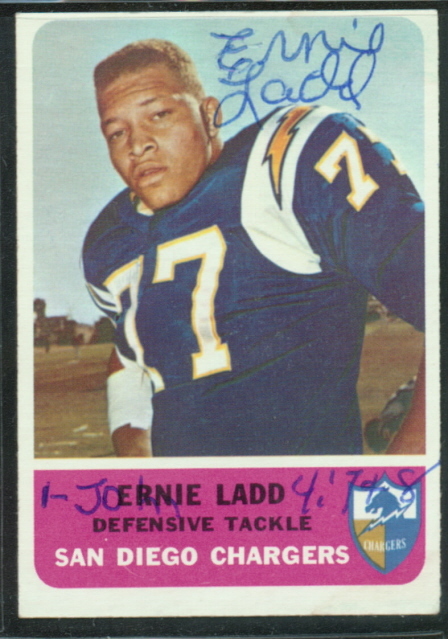 ERNIE “GIANT CAT” LADD – Ernie Ladd was one of two rookies on the Chargers defensive line in 1961. 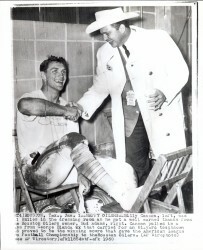 The 6 9” and 325-lbs. 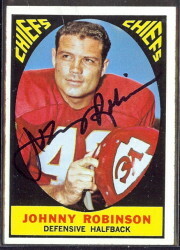 defensive tackle from Grambling University was so big that opposing linemen said that he blocked out the sun. Known for his size, appetite and defensive prowess, Ladd stunned one sportswriter who made the mistake of taking him to dinner. 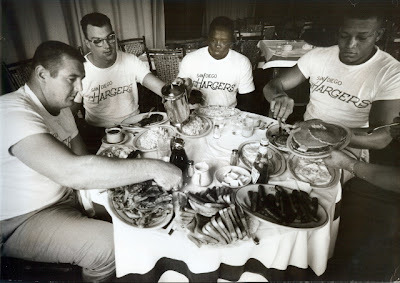 Ladd’s nighttime nosh consisted of two shrimp cocktails, three dished of cole slaw, three servings of spinach, three baked potatoes, eight rolls with butter, four 16-oz steaks, a half-gallon of milk and three desserts. 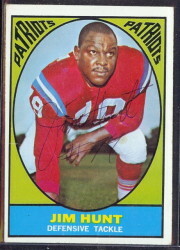 Ernie Ladd was an AFL All-Star from 1962-1965, and was voted All-AFL in 1961, 1964 & 1965.